« Is the Footy Show still Relevant ? There has been much discussion about the Queens Birthday Public Holiday, celebrated this Monday . This is not her actual birthday , which falls in April . Many question the relevance of supporting an archaic institution , of British Royalty , and celebrating its leaders birthday. Republican and Humanitarian arguments aside ,footy fans are the big winners . AFL Football matches are played , on every day of the long weekend . Games are scheduled to begin on Friday night , continuing on Saturday and Sunday , and culminating with Monday's Game at the MCG. Its a media , broadcasting , and footy fans feast. Record attendances , are expected at all matches .Fans will be out in their football jumpers, jerseys , guernseys to watch their team play . Most will be in a relaxed , party mood , knowing they have the Monday holiday to recover . 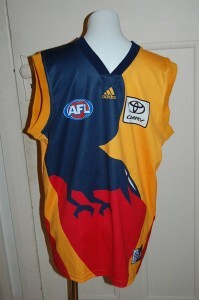 This entry was posted on Friday, June 11th, 2010 at 8:32 am	and is filed under AFL. You can follow any responses to this entry through the RSS 2.0 feed. Both comments and pings are currently closed.